The 2016 NHLPA Golf Classic was held at the beautiful Predator Ridge Resort in Vernon, B.C. on Thursday, July 7th. The NHLPA's 24th annual charity golf tournament saw four players each captaining a team in the NHLPA Charity Shootout component of the tournament. Each foursome played in a shamble format as they competed for some amazing prizes on the renowned west coast course for a second consecutive year. Since its inception, our annual Golf Classic has raised $3.5 million for various charities including the Players Helping Players fund, Habitat for Humanity, Ronald McDonald House, and World Vision - just to name a few. All participating current and former NHL players were broken into four teams that were led by team captains Devan Dubnyk, Ryan Johansen, Peter Holland, and Shea Weber. Each team competed for a significant donation for their respective player-chosen charitable organizations. The following players attended the NHLPA Golf Classic: Dave Babych, David Booth, Tyler Bouck, Chris Campoli, Blake Comeau, Adam Cracknell, Cory Cross, Byron Dafoe, Brenden Dillon, Devan Dubnyk, Vernon Fiddler, Cody Franson, Brent Gilchrist, Eric Godard, Josh Gorges, Greg Hawgood, Peter Holland, Kelly Hrudey, Ryan Johansen, Ed Johnstone, Bracken Kearns, Dennis Kearns, Chuck Kobasew, Dean McAmmond, Kirk McLean, Sandy Moger, Christopher Murray, Riley Nash, Jason Podollan, Mason Raymond, Joe Reekie, James Reimer, Mathieu Schneider, Todd Simpson, Jerred Smithson, Jordin Tootoo, Dixon Ward, Steve Webb, Shea Weber, Rob Zamuner and Rob Zepp. The players' tournament raised more than $100,000 this year, and the charity purse was divided based on the finish of the player-captained teams. Below are the results for the teams, and the dollars they earned for the four causes they chose. The tournament came to a close with an eventful reception - hosted by former NHL goaltender and current broadcaster Kelly Hrudey - that treated participants to a dinner overlooking the immaculate Predator Ridge golf course views, an impressive silent auction, and the top 16 foursomes all earned prizes. The players and guests also had the opportunity to challenge themselves in a Par 3 Challenge, sponsored by the NHLPA's lead player apparel supplier, Nobis. Guests also enjoyed a glow-in-the-dark Nike Night Golf Challenge for the chance to win some fantastic prizes. 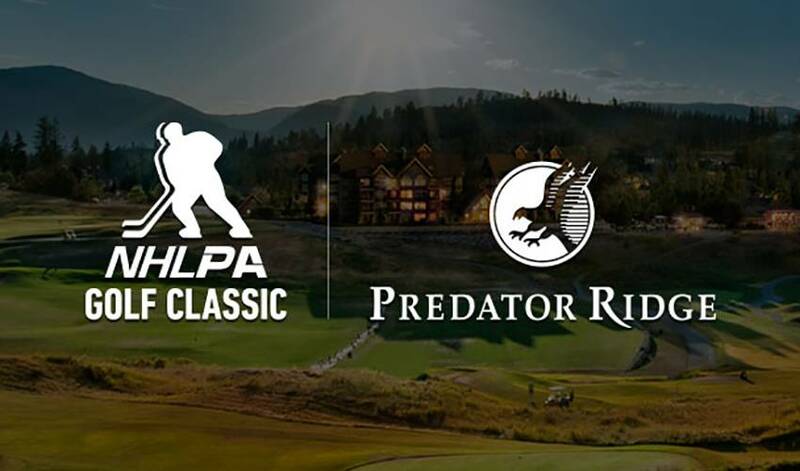 The links at Predator Ridge Resort served as a beautiful setting for the 24th annual NHLPA Golf Classic, providing an unforgettable experience for those in the tournament.